Sorry, but Avery Style Edge Two Pocket Folder Assorted (1pk) - 47859 is no longer available to buy. Show the world you grasp both form and function. These Avery Style Edge Two-Pocket Folders are both durable and eye-catching for organization that really stands out. A sweep of bright color along the spine accents both the front and back covers. Two interior pockets provide ample room for important paperwork, and a business card holder lets you quickly personalize the folder. Durable, nonstick polypropylene is light and flexible and won't lift print off your pages. Predesigned Avery templates and software provide easy customization of title pages. With a combination of style and practicality, these Avery folders will definitely give you an edge. I have been buying this product for years and its always a great buy! 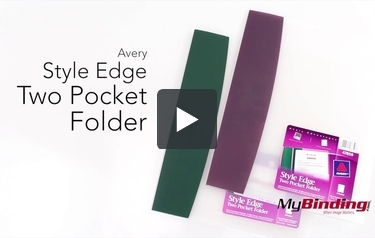 These are Avery Style Edge Two Pocket Folders! As you can see, it’s a frosted clear cover—not perfectly clear. They have one edge with an assortment of professional looking colors. Which exact color you get is a fun mystery! On the inside is a spot for a single business card, and it fits nicely in there. Really the only worry is that the plastic does not stick to the pages at all. So if you drop your folder, then you could have a mess. But, otherwise it’s a pretty nice folder—built well and easy on the eyes, and it won’t smudge ink from your pages. How many folders in a pk? This specific item is 1 per pack. They do say assorted because there are several colors. We get them in a bulk packaging so we cannot request specific colors so we mark it as assorted. If you need anything else, please feel free to call us at 800-944-4573.